She may look more like her dad than me, and the grocery store check-out lady has to remind me each visit of this, but I’m telling you, this girl is so her mama when it comes to her sense of humor… and patience and maybe even temper, BUT that’s not what we’re here to talk about today peeps… so let’s get back to laughing! AND SMILING! We setout to find a Kids Valentine’s Day Card that would make the world smile, and quite possibly even a laugh. We hunted high and low, and by this I meant scrolling up and down through pages and pages of DIY Valentine’s Day Cards on Pinterest and we found many cute one, but only one that really resonated with us. Everyone knows Valentine’s Day and candy go together like Chicken Strips and Fries (#pickyeatermomunite), and it’s why when we saw this Valentine’s Day Card first on Pinterest, we knew we had to recreate it ourselves. Pose your littles clenching their fists holding it out in front of them. As if they were giving someone a bouquet of roses, minus the flowers. Get it? Then you will print off however many kids you plan on passing them out to. Printing a few extra in case you make a mistake. I may have learnt the hard way! 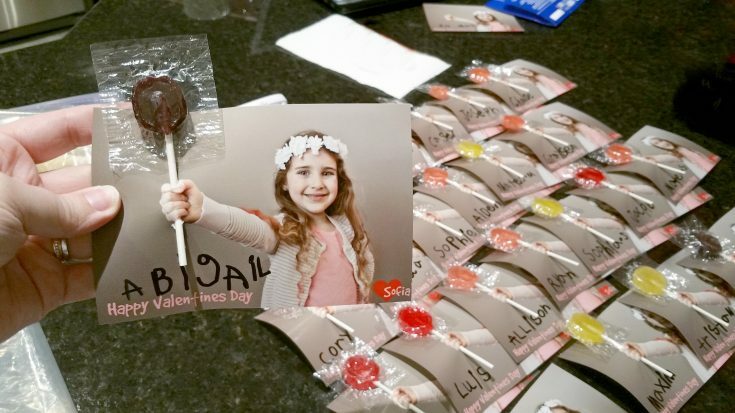 How your little one customize them with a note on each card. Do this before the next step to make this easier for them. Now cut a small hole/slit on each picture, at the top of their fist and then at the bottom. Insert a lollipop through the top and out the bottom. Just like that, you’re done! Now that I’m thinking about it… I bet our Edible Playdough wrapped up in a cute little mason jar, with a added heart cookie cutter would be a sweet little Valentine’s Day Treat for her classmates. Hmmmm I wonder how the parents would feel about kids jumping off the walls after eating, I mean playing with that.